Abandoned garden tools in a local park. Oh a lawn roller!! My Grand-pa had one of these in his garden! As I remember as beautiful as that one! I love photos of old stuff, and this is a perfect one! That is beautiful. I'd like to have one of those as a "sculpture" in my yard! I'm with Ivy — I'd love to take that home, whatever it is. It looks old. I don't think manufacturers bother making tools pretty nowadays. The charm of the past in one shot! The nostalgia is stressed by the fallen leaves. That's Art, Mo! Comparing to some of the other pictures, this one looks a little sad. 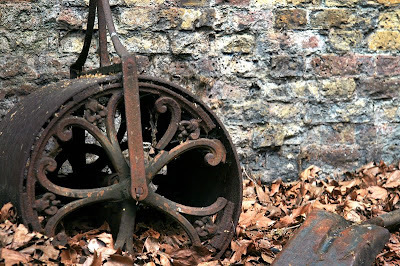 A lovely decorative old roller. I can understand that it might be a little heavy to nick ... but the shovel? Nice up against the patina of the old stone wall, Mo. this one is so simple, yet the lines are so graceful and aesthetically pleasing. Oh, I like this lawn roller, it has flair. Beautiful and no one singing 'Any old iron'. I'm captivated by this old tool! Love it! Really nice shot. Bank holiday Monday is a day for gardening! Lovely rustic scenery from the old world.